Right now I’m using beet juice to dye washcloths that I have knit and crocheted. I found this great article about another great idea for beets. I hope you enjoy it. 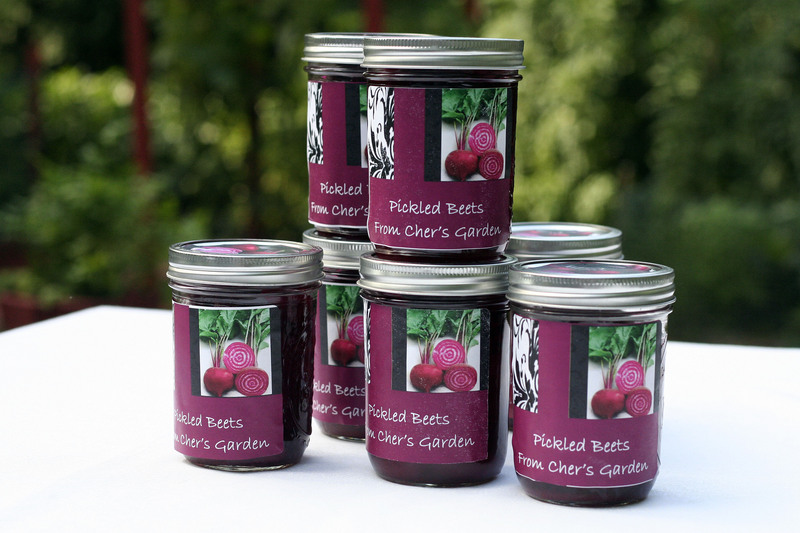 What to do with all those beets – try canning some Pickled Beets and make Your Own Beautiful Canning Labels! Recently, someone asked me if the Zinnia is my favorite flower. Not really, but one would think so. Don’t get me wrong, I love the Zinnia. Roses are my favorite flower…or maybe tulips…honestly I would be hard pressed to pick just one as a favorite. I really love flowers. I think if I could only have one type for the rest of my life, I’d pick hydrangea. Having said all that, I do love the zinnia. What’s not to love? They’re easy to grow, love to bloom and come in so many shapes, sizes and colors, there’s really something for everyone. Last year I had one garden bed at the side of the house that was designated for winter squash, but it never got planted. I realized that I really don’t like staying too long on that side of the house because it is near the road. Seaweed or Woads, 2 months old. I have this silly cat, Woads, that was abandoned by his mom at three days old, that I subsequently, bottle fed and raised. Now, when I’m outside, he’s right at my feet. If I’m on that side of the house, he’s too close to the road, because when he gets scared, he climbs me. Now do you see the dilemma? So, this year, I tripled the size of the bed and planted flowers. The idea was to be able to attract pollinators, beautify the public side of the house and have a bed that I could plant and let be. It was such a good plan. Three days after I planted, we had torrential rains. While the rest of the beds loved the rain, the flower bed with it’s tiny seeds, took a beating. The result? The title of this article is deceiving as I am not going to talk about making hay. This is what you would want to do when the sun is shining. Instead, I want to talk to you about what to do when it’s raining, especially if it hasn’t been raining enough. When we moved to Tyler, almost exactly one year ago, we were told that the area was having the most severe drought in a hundred years. But, it really didn’t seem that “droughty”. There were trees that seemed fine, the grass was a little frayed but not dead, and it wasn’t until August that we were officially issued a “burn ban” in our county. I’ve barely been in the garden this week, but today is cool and gorgeous; so this may be a short post. A reader wrote me to ask what a parasitic wasp was and how, as I had suggested, they could make them their friends? What a great question to answer on Botany day! These little guys are very small, sometimes 1/100th to 3/4’s of an inch long. That’s small. So small, in fact that they often go unnoticed, to humans.